I live in Texas now, but did not grow up here. So I had never even heard of Healthy Texas Caviar until recently. Texas caviar is nothing like caviar at all. 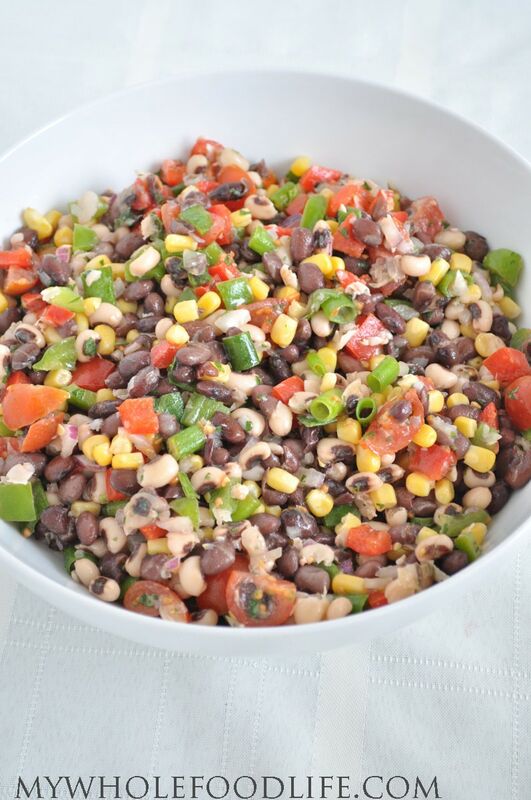 In fact, Texas caviar is a bean salad. You can also use chips to scoop it up like salsa. It’s very yummy! 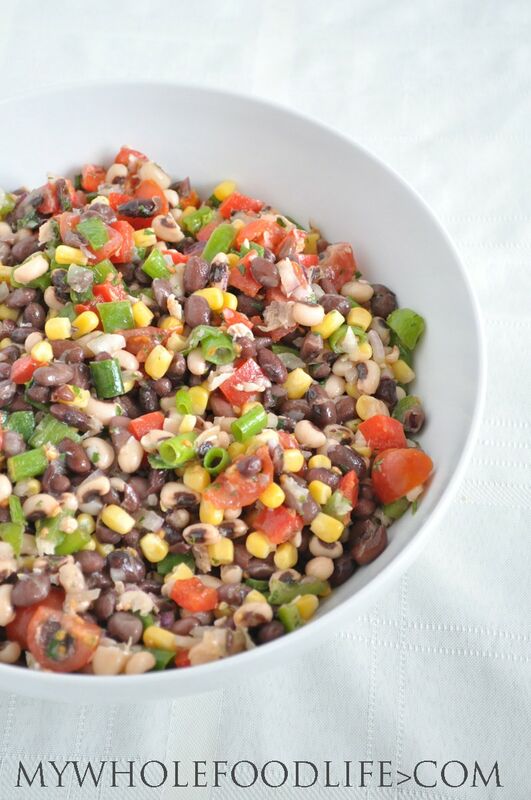 This healthy salad could easily become a staple at summer parties! We all need more healthy salad recipes right? This is healthy salad is perfect for summer. You don’t even need to heat up your kitchen making it. We used dried beans to make this recipe, but you can also use canned if you like. The measurements in the recipe are taken after the beans were soaked and cooked. I hope you enjoy this healthy recipe as much as we did. We filmed a short video of this recipe below. For more videos, you can subscribe to my You Tube channel. A super healthy recipe that you will love! I think the flavors get better as the salad sits in the fridge overnight. This should last about a week in the fridge. Enjoy! Normally, jalapeno is added to Texas caviar. I didn't add it because I am a huge wimp when it comes to spicy food. Feel free to add some in if you like! Can someone please tell me.... when does this go bad!! I made mine about a week ago.... been in the fridge since. Made last Thurs, Im wanting to eat it right now!! How do you tell when its bad? It will smell off it's it is bad. I think it generally lasts about a week in the fridge. Mmh, this sounds absolutely delicious. And that should say a lot coming from me as the odd vegetarian who doesn't like salad. At least not the piles of leafy greens - this one looks a lot better. Too bad black beans are an ingredient I happen upon once in a blue moon and black-eyed peas are non-existent around here. Where do you live? I find them everywhere here. Im living in Germany so it's probably not too surprising. Neither are common here. Our "classics" are kidney and white beans, peas, sometimes broad beans. 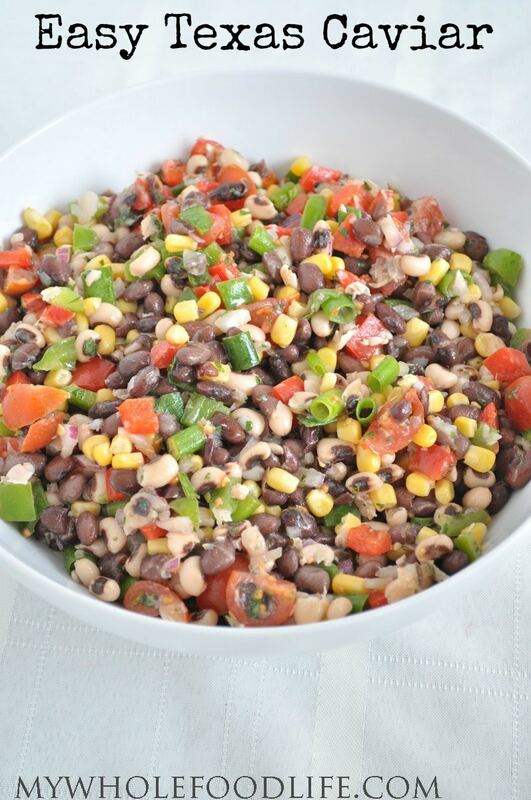 I bet you could try using white beans in place of the black eyed peas. Kidney beans might work too? I live in Australia and I have only just in the last couple of weeks been able to get canned black beans at the local supermarket! I can get black eyed peas but have never used them before. I usually add chopped cilantro and avocado too. This looks delish! Is there both red and green onion in the salad? In the picture it looks like green onion but the ingredient list says red......just wanted to double check. Thank you!! Thanks for catching that! My husband wrote the recipe and emailed it to me. I guess he forgot to add in the green onions he used. I will edit the post now. Oh my goodness!!! I think I just ate 2 bowls of this!! So good!!! Yay! I had the rest of ours for lunch today. Added avocado. OMG so good! Glad you liked it too! Gotta add the jalapeño. Not Texas cavier without it. Feel the burn, baby! Yeah! My husband did to his! I am a wimp with spice. We just love Texas Caviar...I haven't put in the green onion but I bet they would be yummie I bet the green onions a delicious in the caviar. They were! So was avocado. Sounds seriously good and I live in Texas! I have never heard or tried this either. Definitely need to try it. Thanks! Where do you live? I am Richardson. Small world! I love Texas caviar but mine has always had sugar in it......trying to cut that out. I've typically eaten it with chips......do you have a recommendation on what to eat this with? You can eat this with some homemade, baked chips. It's also very good on it's own. Does anyone know how many calories are in Texas Caviar? I'm sorry, I don't know, but you can plug the recipe into My Fitness Pal for a rough estimate. I've been wanting to try this for weeks. I finally remembered to get the ingredients when I went to the store. So yummy! I used frozen for this and I just let it thaw on the counter before adding to this recipe.